This is one of the targets set out in the recently published ‘A Manifesto of Water’ to help improve customer experience of the water industry in England. Water UK, the organisation that represents and works with the major water (and wastewater) service providers in the UK, has put together the manifesto to show a summary of water companies’ plans for the next 5-year period 2020-2025. The plans lay out how each water utility company intends to provide their water and sewerage services over this period and how they intend to meet their responsibilities of providing the most essential of public services. One of the key elements that has come out of the manifesto, is the industry’s intentions to reduce supply interruption time for customers by 36%. In the last year there were over 54,600 mains pipe bursts in the UK. As just one of the potential causes for a supply interruption, this highlights how common an occurrence they can be. For water utility companies, interruptions, whether planned or unexpected, can cause criticism from customers no matter how well they deal with each incident. Water is an essential part of everyday life, and not many people ever expect that they’ll be without it. Providing shorter interruption times in any event can reduce reputational damage from dissatisfied customers and regulatory fines as a result. How do they intend to do it? Some of the water utility companies have laid out in their proposals their intentions to ensure reduced supply interruption times, including reducing reliance on single sources of supply, strengthening the integration of water networks across regions and improving the predicting, preventing and tackling of burst pipes. Water companies may also engage an alternative water supplier to deliver additional supplies directly into the mains network during an interruption. Oliver Silcock, Water Direct’s Head of Operations explains the use of network injections and how they can reduce interruption times or prevent an interruption altogether. “Through our network injection protocols, we’ve developed an innovative means to ensure a water supply is maintained through the normal piped network during a potential interruption. This is achieved through using our state-of-the-art tankers, equipped with specialist pumps that inject water directly into the mains network at a defined pressure and flow rate. During an unexpected supply issue, the network injection process contributes significantly to reduced supply interruptions because consumers still receive water through their normal pipework; and the water company has not ‘failed to supply’. This also creates opportunity for the supply issue to be found, repaired and reinstated without having any customers remain off supply for an extended period of time in the process, and in some instances, can mitigate an interruption altogether. Network injections are also used to keep areas on supply during planned maintenance, meaning businesses and households experience their piped supply operating as normal. If a network injection is performed well, the end user will not notice a change in their water supply service. 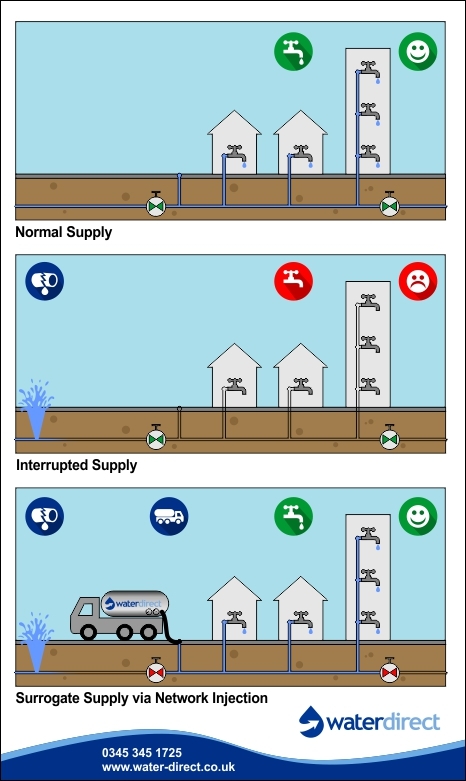 In addition to decrease the time that water supplies are interrupted to consumers, this process can also assist with flushing and network maintenance or to re-pressurise a section of the mains that’s had a leak for example; so that the utility water company can track, locate and repair it. In some instances, network injections are also used to re-supply water utility assets such as service reservoirs and holding tanks, where the usual incoming feed has been compromised. Water Direct has pioneered the practice of network injections on behalf of water companies over the past 22 years; it’s the sort of activity we undertake on a daily basis. As customer service is growing ever more important, and a large part of that for water companies is continuity of supply, more and more utilities are using network injections to reduce customer downtime during any form of interruption. To meet this demand and expectation, we are continually improving our equipment and processes. The latest phase of this innovation has been to devise a new one-of-a-kind tanker mounted pumping system. Once programmed with the desired parameters, the pumps will read the input pressure and flow rates and automatically adjust pump speed accordingly. The pumps even take control of the lorry itself and shut the engine down when there’s no need for pressure to be introduced, this reduces idling times, noise pollution and CO2 footprint. Whilst in this ‘sleep’ mode, the pump still monitors the mains pressure, and as soon as it sees a need, it’ll wake the lorry up and kick back into action by itself, bringing the mains up to the desired pressure. Since our development of safe network injections, the process has proved invaluable in preventing and reducing water supply interruptions for the consumer, helping water companies to continually improve customer service as well as working towards the industry targets set out by Water UK.